Kompyte's Dashboard is the first thing you see when you login to the platform. Think of this as your competitive intelligence command center! From this single page, you'll get an overview of each element of Kompyte, and therefore, a glimpse of everything that's going on in your market. At the top of the page, take a look at a few of the most recent changes to the websites you're tracking under Latest Website Changes. 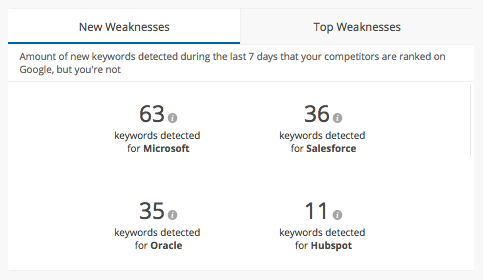 The Dashboard highlights 6 of your competitor's most recent webpage changes. 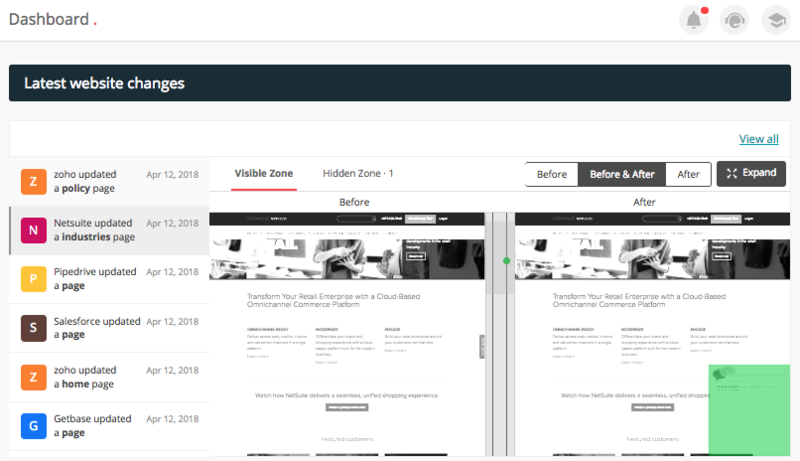 Keep in mind there could be more than one update listed under an individual competitor - view each unique update from the top bar which displays different elements of the website as a unique change (Visible Zone & Hidden Zone 1 in the photo above). The default view is the Before & After split-screen, however you can alter this, or expand the window to get a more complete overview of the website changes. Elements that were changed or removed appear highlighted in red on the left and elements that were added appear in green on the right. Next, Kompyte's Dashboard summarizes a short Paid Campaign Analysis entitled Ads Performance. 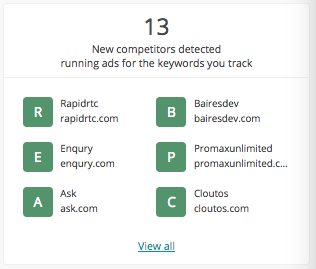 Kompyte displays the number of ads you're currently running as well as the number of keywords you're running ads for. 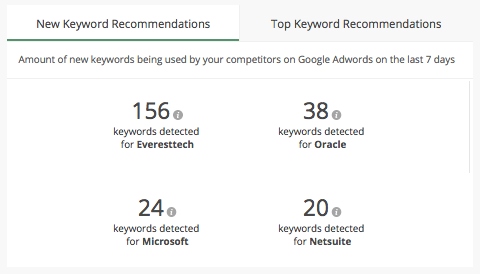 Lastly, the platform recommends keywords based on your competitors ads. the Info icon next to the number. 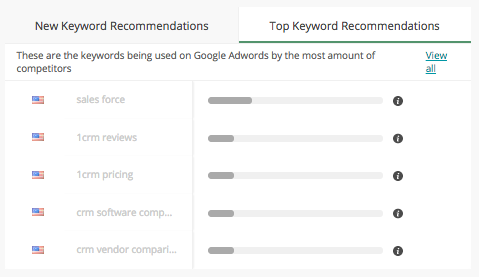 keywords and whether they are running an AB test or regular ad campaigns. 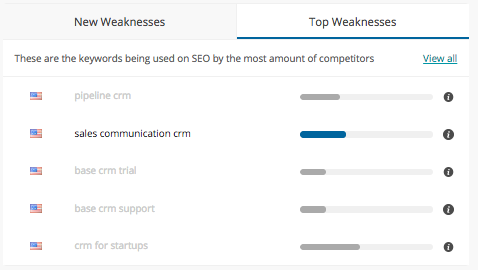 keywords you track. You may wish to start tracking these competitors. 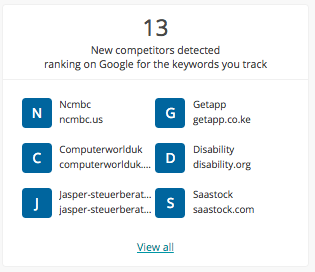 The third part of dashboard is SEO Performance which updates you on your Average SEO Position, Number of Keywords in which you rank in the top 10, positions 11-100 and the number of keywords for which you're ranking greater than 100. Kompyte also charts your average SEO position in the last 30 days versus the competition you're tracking. view the list of keywords by hovering over the Info icon next to the number. their rank as well as recent changes. Lastly, Kompyte's Dashboard discloses your standings in Blog & Social Content. This includes the change in your community size, activity levels, engagement rate and overall engagement. After your standings in Blog & Social Content, Kompyte shows you the competitors that had the highest increase in community size, engagement rate, activity level, engagement rate and overall engagement. At the bottom of Kompyte's dashboard, get caught up on your competitor's 5 most recent Social Media & Blog posts. Kompyte's Dashboard is a great place to focus if you only have a few minutes to spend in the platform or you're not looking to dive in to any particular element too deeply. It's a excellent place to quickly make sure you're up to date on all the competitive intelligence in your industry.